Protein, Vitamin C, and Yumness Galore! (I like to find peppers that can stand up pretty well, so they don't fall over while cooking). (You can substitute a can of Black or Pinto Beans, drained and rinsed, if you don't eat tofu). Combine the rice and water with a dash of salt in a medium sized pan. Bring to a boil, then reduce to low heat. Simmer for 40 minutes or until the rice is tender, adding more water if necessary. While the rice is cooking heat the olive oil in a large skillet to medium heat. Add the diced onion, garlic and poblano. 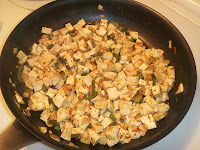 Cut the tofu into small cubes and add it along with the Sp ike to the mixture. Stir frequently to ensure that the tofu gets crispy on all sides. Cook until the tofu is golden brown. If you are choosing to use beans instead, cook the onion, pepper, garlic mixture, but do not add the beans. Cook until the onions begin to turn a golden color. In a large mixing bowl, combine the cooked rice, drained tomatoes, chili powder, Mexican seasoning, cheese, and tofu/veggie mixture. If you are using beans instead of tofu add them now as well. stir gently until mixed well. Add salt and pepper to taste. Cut the tops off of the peppers and seed them. Stuff the peppers full of the mixture and bake at 350 until brown on top. 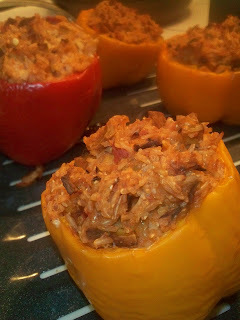 If you like, you can add some extra cheese overtop of the peppers while baking.